George Orwell’s 1984 book reports discuss one of Orwell's best known dystopian science fiction novels. Paper Masters can write a custom paper on George Orwell’s 1984 from scratch. This is a sample introduction. 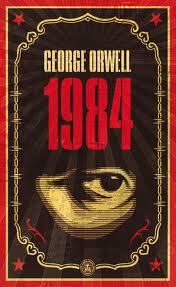 1984 is one of writer George Orwell’s most well known works and was published in 1949. The novel is a dystopian science fiction work. Through the years the novel has been viewed as a classic and in 2005, TIME magazine picked it as one of the best novels written between the years 1923 – 2005. Proles which is the lower class and make up a huge majority of the population. The novel focuses on the main character Winston Smith who is a member of the Outer Party. Winston is confined to a one-room apartment. He decides to write a journal to help pass his time. If discovered by “Big Brother”, his writing could be punished by death. He must be careful because of the government’s ability to spy on all citizens. One day Winston is passed a note from a woman that he loathes. It simply read I LOVE YOU. The woman is Julia and Winston’s feelings toward her change once he reads the message. With similar political views, Winston and Julia begin an affair, which they believe is secret but is known by the Thought Police because of their spying ability. Julia and Winston are arrested by the Thought Police, beaten, and interrogated. Winston is also tortured by electroshock. Winston is forced to confess all his crimes and implicate anyone else he knows has committed a crime including Julia. Winston still loves Julia even though they are no longer together and he betrayed her. The two run into each other and both admit to betraying each other. George Orwell Animal Farm book reports look into Orwell's novel that describes the Russian Revolution of 1917 and the dictatorship of Josef Stalin. Order a research paper on George Orwell's Animal Farm from Paper Masters. George Orwell Biography research papers look into the author well known for his novel Animal Farm. 1984 and Brave New World - It is the purpose of this sample topic outline to show any college student how to compare/contrast George Orwell's 1984 with Aldous Huxley's Brave New World. Symbolism in Animal Farm - As one of the most profound pieces of literary political commentary, George Orwell's Animal Farm contains a host of essential symbols within its pages. George Orwell Animal Farm book reports look into Orwell's novel that describes the Russian Revolution of 1917 and the dictatorship of Josef Stalin. Shooting an Elephant Research Papers look at the author's personal experiences as a member of the Imperial Police in the 1920's. Animal Farm - George Orwell's Animal Farm has always been recognized as a thinly disguised parody of the Soviet Union. Orwell used various animals to represent different people. Paper Masters writes custom research papers on George Orwell’s 1984 and discuss one of Orwell's best known dystopian science fiction novels.